Before 1970, worlds telephony systems were based on single line, voice frequency, and all connections were over twisted copper pair. During early 1970’s digital transmission systems began to appear using Pulse Code Modulation (PCM). PCM enables analogue waveforms such as speech to be converted into a binary format suitable for transmission over long distances via digital systems. PCM works by sampling the analogue signal at regular intervals, assigning a binary value to the sample and then transmitting this value as a binary stream. This process is still in use today and forms the basis of virtually all the transmission systems that we currently use. Next step was multiplexing several PCM together over the same copper pair. 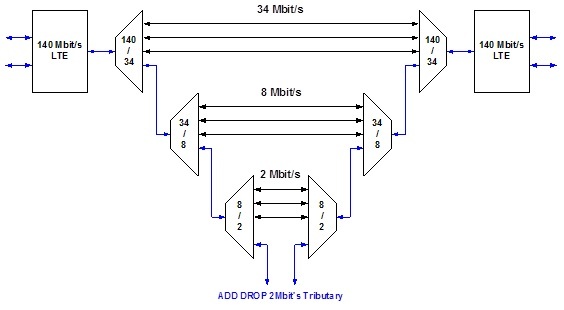 A standard was adopted in Europe where thirty-two, 64kbit/s channels were multiplexed together to produce a structure with a transmission rate of 2.048 Mbit/s (usually referred to as 2 Mbit/s). As demand for telephony services grew, Four X 2 Mbit/s signals were combined together to form an 8 Mbit/s signal (actually 8.448 Mbit/s). , This is because 2 Mbit/s signal was not sufficient to cope with the demands of the growing network, and so a further level of multiplexing was devised. Further, additional levels of multiplexing structure were added to include rates of 34 Mbit/s (34.368) and 140 Mbit/s (139.264). These transmission speeds are called Plesiochronous Digital Hierarchy or PDH rates. This means that PDH equipment operates with similar timing but not exactly the same timing. A different hierarchical structure was adopted in North America. Comparison between two systems are given below. PDH signal is structured in such a way that, it is impossible to extract a single 2 Mbit/s signal from within a higher order (say 140 Mbit/s) stream. In order to cross connect 2 Mbit/s signal between one transmission system and another, it must be de-multiplexed back down to its primary rate first. This forms a multiplexer mountain. So, we need to have a lot of equipment’s just to connect 2 Megs together. More usable space & power is taken up in racks in node sites by these equipment mountain & cause more maintenance-associated problems. Equipment in different hierarchical levels synchronised from a different source and at a different rate, which may lead to clocking problems that can cause errors. For a simple 2 Meg signal, jumpering needs to be done at all levels, that make up the individual transmission system. This leads to large amounts of physically bulky coax wiring. Automatic storage of route information is not available which leads to the requirement of accurate paper records to avoid problems. It is not possible to remotely configure equipment and the alarm monitoring is only limited to reporting loss of inputs. Protection of the transmission paths is generally using 1+1 protection and available at the higher PDH levels i.e.140 Mbit/s and above only. Interconnection between different national systems were difficult (European/North American). Clocking in different hierarchy levels are done individually, so slips possible. 'Multiplexer mountain' is costly and inflexible. Path Protection available at higher rates only. While comparing to today’ standards, more Prone to faults. All these systems works fine in a stand-alone hierarchy. But it does make international inter-connection very difficult and costly. This was the major reason for the development of a new internationally agreed standard (SDH).